This project is a long distance collaboration between two amazing artists : Andrea Noce and David Kristian during the year 2013. Each track have been made after set up basic guidelines (style, tempo, structure, and workflow). « It was exciting to think two people on different continents, using different setups, and software, could find a way to exchange loops and build a track in the space of 36 hours. » In the line of label such as Innovative Communication or Edition EG , this record is completely intemporal, made for the past, the present, the future, with marvelous atmospheric and space sounds, escape from your body and synchronise. We are really proud to lunch it on Macadam mambo today. David Kristian has been making electronic for over 20 years, composing everything from experimental music to IDM, electro and synthpop. With over a dozen albums and countless 12″s and compilation appearances, David’s discography continues to grow. David’s soundscapes and soundtrack can also be heard on everything from science-fiction and horror movies to promotional spots for an X-rated cable channel. 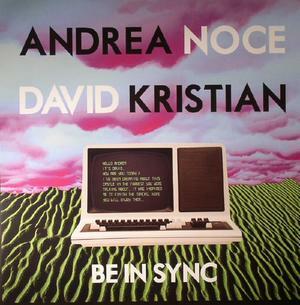 Andrea Noce is a very talented singer, producer, polynstrumentist and visual artist based in Berlin, she has many different projects in solo (Eva Geist), in group (Vera Mona, Le Rose) or collaborations.